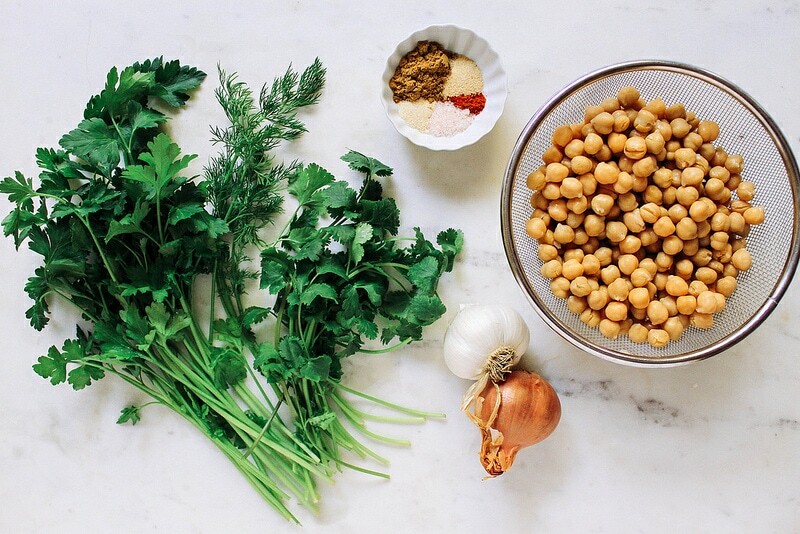 Chickpeas are an amazing bean and I’m finding out just how versatile they are! I’ve used chickpea’s in a lentil stew, roasted them with spices for snacking on and sprinkled them on top of salads. They are the main ingredient in hummus, which is just as versatile as the chickpea itself. Freshly cooked, they are wonderful and I have no problem snacking on them just like that. You can also make good things like socca bread and chickpea omelets. Its flour can be used and combined with other gluten-free flours to make gluten-free baked items too. And now, I come across the falafel, another great way to use chickpeas. High in protein and full of fiber, anything made with chickpeas is a great addition to a healthy lifestyle. Falafels are a Mediterranean food and can be used in various ways, such as, salads or made into sandwiches using pita bread. Enjoy them with a drizzle of creamy dressing or by simply pairing your falafels with hummus, a flat bread and fresh fruit for a great snack or simple meal. 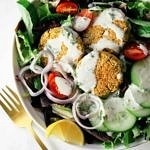 Along with the falafel recipe are 2 creamy style dressings. One is a more traditional dressing using tahini as the base while the other is not so traditional using avocado and cucumber. The avocado and cucumber dressing is inspired by my Avocado & Cucumber Soup and works great as a dressing too. I couldn’t pick just one to share so they both are here for varying tastes. Everything is super easy to make. I hope you enjoy it all! I have used canned and fresh soaked garbanzo bean, but once everything is blended together the canned and fresh soaked chickpeas tasted about the same. I like the convenience of using canned, but it’s nice to be able to use dried, soaked beans as well. The soaking just takes some patience. If using dried beans, there isn’t any need to cook them, just soak them as they will be soft enough to use in the recipe. Use whatever is easiest and convenient to you. You may like to try them both and see which way you like best. I’ve also made baked falafels with added flour and/or oil like some recipes call for. I personally found the flour and oil to not be necessary and have omitted them in this recipe. 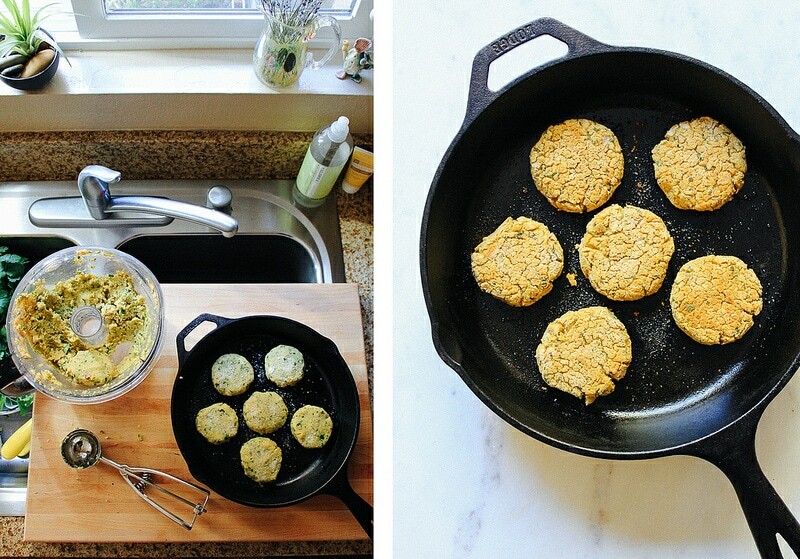 I’ve baked my falafels in a skillet and on cookie sheets, both work great. I’ve also added a few extra ingredients like dried coriander which is nice but have omitted it here just to keep it simple as possible (although I do have the garlic & onion powder – I like them for good measure). But by all means, if you have coriander on hand go ahead and throw in a teaspoon. As for the greens, feel free to use only parsley or cilantro. That’s a little about my experiences. I’m sure there is more to learn and each of us will have varying outcomes due to our kitchen appliances, tools and taste. These were flavorful, delicious falafels and I see them being made fairly regularly around here! If using dried chickpeas, place beans in large pot and cover with at least two inches of water (they will puff up), let soak overnight or at least 12 hours. No need to cook them, they will be softened enough to use in the recipe. If using canned chickpeas be sure to drain and rinse well by running the beans under cool running water. If using freshly cooked chickpeas you will need about 1 1/ 2 cups. Shape your falafels into medium size patties like you see here or make bite size nuggets. I played around with different size falafels. The bite size ones were especially great in a salad and I was able to get 16. You can vary your size according to your needs and uses. All the sizes cooked for the same amount of time and came out nicely firm on the outside and perfectly soft and tender on the inside. They weren’t dry and crumbly. Any size will work great for salad toppers or sandwich fillers. Once your salad is put together, add your dressing of choice and dig in. This was a most delicious salad! Falafels are incredibly easy to make. No need to fry falafels in tons of oil, they bake up perfectly in the oven. Add them to a fresh salad with a creamy tahini-dill dressing and you’re in for a delicious meal! FALAFELS: If using dried chickpeas, place beans in large pot and cover with at least two inches of water (they will puff up), let soak overnight or at least 12 hours. No need to cook them, they will be softened enough to use in the recipe. If using canned chickpeas be sure to drain and rinse well by running the beans under cool running water. If using freshly cooked chickpeas you will need about 1 1/ 2 cups. Preheat oven to 400. Coat your cast iron skillet or cookie sheet with olive oil. 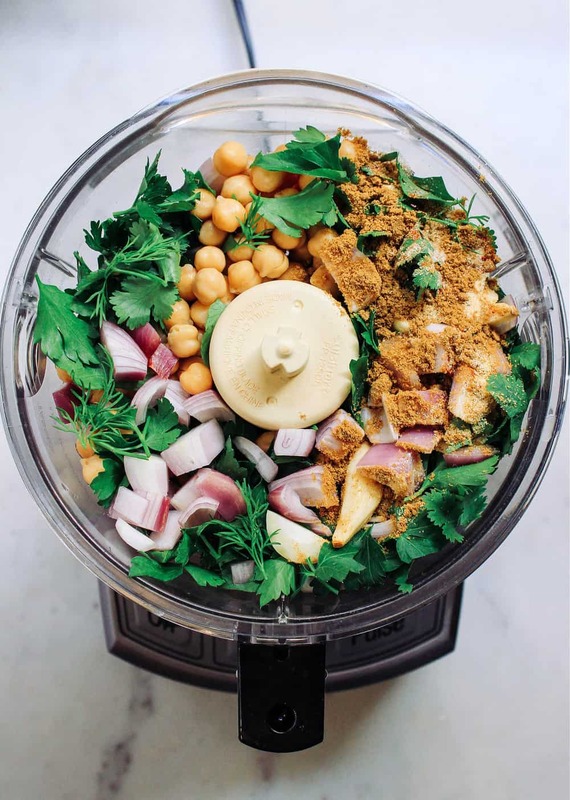 In food processor/blender, combine all the ingredients for the falafel. Blend until blended and fairly smooth but not pureed, scraping down the sides as needed. Form patties into whatever size you like…. For medium patties (shown above): Scoop 4 tablespoons per patty…will yield approx. six 1/4 – 1/2 inch patties. For small patties: Scoop 1 heaping tablespoon per patty…will yield approx. 9. For mini patties or nuggets: Scoop 1 heaping teaspoon…will yield approx. 16. Place patties on greased skillet/cookie sheet and bake for 10 minutes. Flip and bake for 15 minutes. Total cooking time 25 minutes. If you find that your falafels are not as browned as you like, place them under the broiler for a minute or two, just be sure to keep an eye on them so they don’t burn. Store leftover falafels in an airtight container. They will soften overnight. To warm them up and return crispness again to the outside, place under broiler or in a toaster oven at a high temp for a minute or two while keeping an eye on them so they don’t burn. 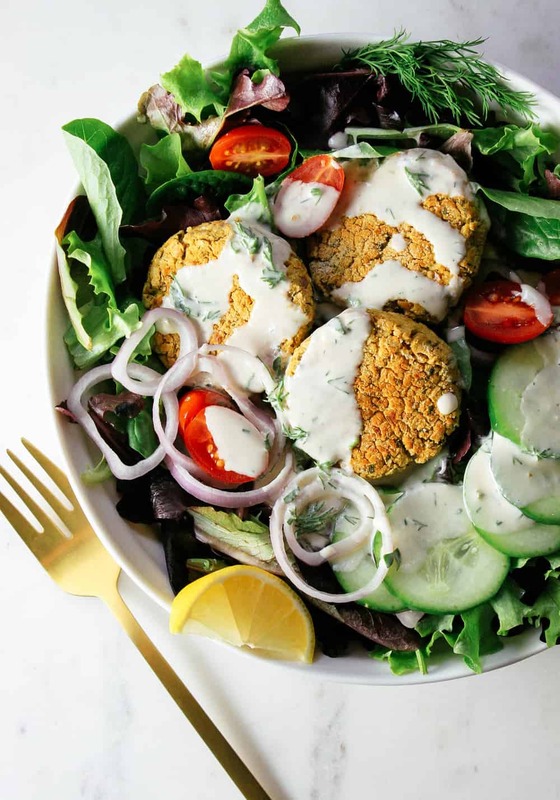 LEMON TAHINI DRESSING: In a small bowl, combine all ingredients and mix until well combined. Taste for seasoning and add more water as needed 1 tablespoon at a time or add more lemon juice. Store leftovers in an airtight container in the refrigerator for up to five days. AVOCADO-CUCUMBER DRESISNG: In food processor/blender, combine all the ingredients except for the water. Blend until smooth. Taste for seasoning. Add water a tablespoon or two at a time until desired consistency. Best chilled in the refrigerator before serving. Leftovers will hold up a day or two in a sealed container in the refrigerator. It may last a little longer but it’s gone by day two around my house. 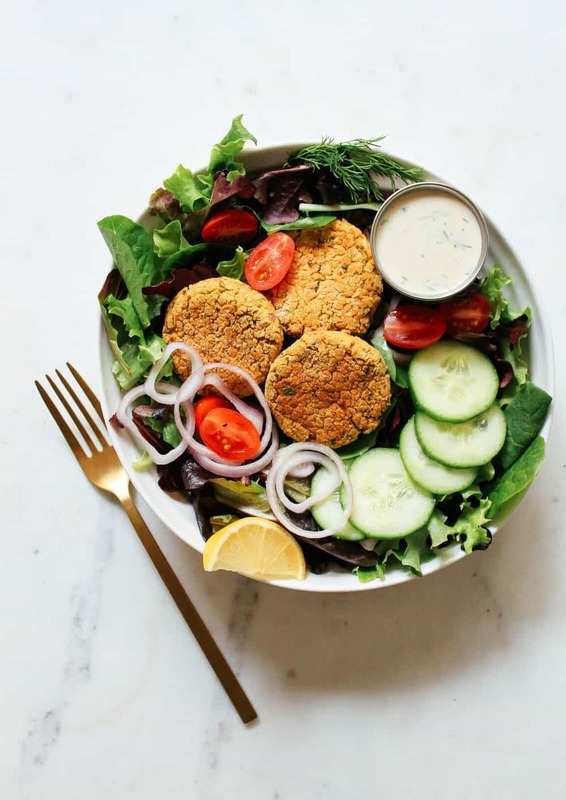 Serve: Once patties are ready, make your salad, top with falafels and choice of dressing. Nutrition information is calculated without dressing.